Four intriguing places on Mars have risen to the final round as NASA selects a landing site for its next Mars mission, the Mars Science Laboratory. 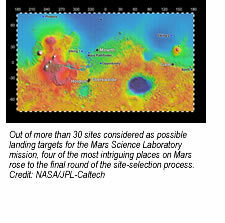 The agency had a wider range of possible landing sites to choose from than for any previous mission, thanks to the Mars Science Laboratory’s advanced technologies, and the highly capable orbiters helping this mission identify scientifically compelling places to explore. Mars Science Laboratory project leaders at NASA’s Jet Propulsion Laboratory chose the four sites this month, after seeking input from international Mars experts and from engineers working on the landing system and rover capabilities. The sites, alphabetically, are Eberswalde, where an ancient river deposited a delta in a possible lake; Gale, with a mountain of stacked layers including clays and sulfates; Holden, a crater containing alluvial fans, flood deposits, possible lake beds and clay-rich deposits; and Mawrth, which shows exposed layers containing at least two types of clay. “All four of these sites would be great places to use our roving laboratory to study the processes and history of early martian environments and whether any of these environments were capable of supporting microbial life and its preservation as biosignatures,” said John Grotzinger of the California Institute of Technology. He is the project scientist for the Mars Science Laboratory. The mission’s capabilities for landing more precisely than ever before and for generating electricity without reliance on sunshine have made landing sites eligible that would not have been acceptable for past Mars missions. During the past two years, multiple observations of dozens of candidate sites by NASA’s Mars Reconnaissance Orbiter have augmented data from earlier orbiters for evaluating sites’ scientific attractions and engineering risks. JPL is assembling and testing the Mars Science Laboratory spacecraft for launch in fall 2009. Paring the landing-site list to four finalists allows the team to focus further on evaluating the sites and planning the navigation. The mission plan calls for the rover to spend a full Mars year (23 months) examining the environment with a diverse payload of tools. After evaluating additional Mars orbiter observations of the four sites, NASA will hold a fourth science workshop about the candidates in the spring and plans to choose a final site next summer. Three previous landing-site science workshops for Mars Science Laboratory drew participation of more than 100 Mars scientists and presentations about more than 30 sites. The four sites rated highest by participants in the latest workshop were the same ones chosen by mission leaders after a subsequent round of safety evaluations and analysis of terrain for rover driving. One site, Gale, had been a favorite of scientists considering 2004 landing sites for NASA’s Spirit and Opportunity rovers, but was ruled out as too hazardous for the capabilities of those spacecraft. For their Mars landings in 2004, Spirit and Opportunity needed safe target areas about 70 kilometers (about 40 miles) long. Mars Science Laboratory is designed to hit a target area roughly 20 kilometers (12 miles) in diameter. Also, a new “skycrane” technology to lower the rover on a tether for the final touchdown can accommodate more slope than the airbag method used for Spirit and Opportunity. In addition, a radioisotope power supply, like that used by Mars Viking landers in the 1970s, will enable year-round operation farther from the equator than the solar power systems of more recent missions. Gale is near the equator, Eberswalde and Holden are farther south, and Mawrth is in the north. As a clay-bearing site where a river once flowed into a lake, Eberswalde Crater offers a chance to use knowledge that oil industry geologists have accumulated about locations of the most promising parts of a delta to look for any concentrations of carbon chemistry that is crucial to life. The mountain inside Gale Crater could provide a route for the rover to drive up a 5-kilometer (3-mile) sequence of layers, studying a transition from environments that produced clay deposits near the bottom to later environments that produced sulfate deposits partway up. Running water once carved gullies and deposited sediments as alluvial fans and catastrophic flood deposits in Holden Crater, a site that may also present the chance to evaluate layers deposited in a lake. Exploration of key features within this target area would require drives to the edge of a broad valley, and then down into the valley. Mawrth Valley is an apparent flood channel near the edge of vast martian highlands. It holds different types of clays in clearly layered context, offering an opportunity for studying the changes in wet conditions that produced or altered the clays. The clay signatures are stronger than at the other sites, and this is the only one of the four for which the science target is within the landing area, not nearby.